It has been a busy busy last few days! Between the Eat My Blog Charity Bake Sale, Artisanal LA Holiday Pop-Up Shop and work I haven’t had a moment to myself. And while I did bake muffins on Monday to share with all of you, I had no time to post about them. 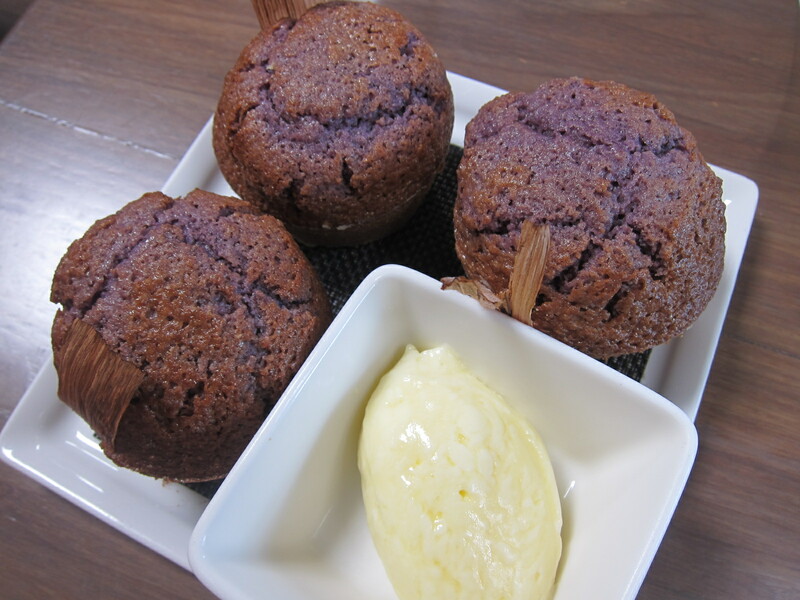 But rather than leave you muffin-less, I thought you might enjoy these blue corn muffins. These are blue corn muffins with almond butter from Chef John Sedlar’s Playa restaurant, and they are hands down some of the best muffins I’ve eaten. They have a nice crunchy exterior with a buttery soft interior. They are sweet and nutty. Slathered with fragrant almond butter, there is nothing better in the morning (or any time of day for that matter.) I even enjoyed them tonight secretly in the kitchen with my pal Caroline on Crack, while a fancy party was happening outside. Being secret special muffins made them that much sweeter! i’ve heard a lot about these muffins – i’ll have to go for brunch soon! Mmmm I love blue corn items! sweet blog, rss following now and hope to see many similar posts soon.